Hi loves! How are you today? Weekend for you too? 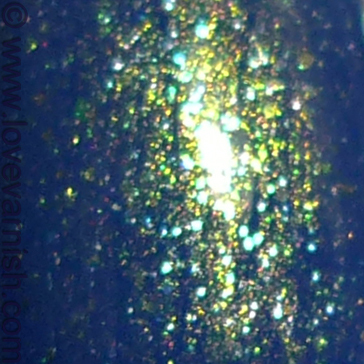 I am showing you a layering polish from Catrice today, this was also released earlier this year together with all the other pretty lacquers. I didn't try it before and I must say, it does like nice in pictures but I am still not that impressed. 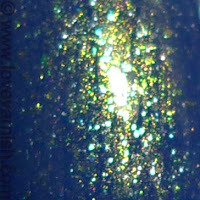 This is Catrice Goldbusters, as the name implies it is goldtoned. It seems to be the same shimmer as in Catrice Squeeze Me and Mint Me Up. I used 1 coat over a base of 2 coats of OPI I Saw.. U Saw.. We Saw.. Warsaw and it gives a lovely effect, but the trouble is this: it doesn't apply very easy. It tends to dry very very quickly, and if you dip your brush for more polish and add it to a not polished part, you'll have an overlap between unpolished and the spot that was hit twice. This is noticable. So, you have to be careful and quick in your application to avoid thicker areas! The endresult is pretty though so I might try it again. What do you think of layering polishes like these? And what would you combine Goldbusters with? I think it's beautiful! It's got a little bit of complexity to it. Erg mooi! Toevallig kocht ik deze vandaag ook. Eigenlijk zocht ik een gouden lak met een goede dekking en had ik van tevoren niet goed mijn huiswerk gedaan door het uit te zoeken ;-) een miskoop wil ik het ook zeker niet noemen. I love layering polishes! Maybe green, aubergine or purple? This is gorgeous! The shimmer is just so amazing! Yes the nurhs and cap is just so flimsy at times! Most formula's aren't bad though. I might try that! That's too bad Jemma! Though it seems Catrice is gettng more easily available worldwide, maybe someday you can buy it easily :). Nee een miskoop is het zeker niet, maar inderdaad niet wat je zocht :-). Ik ben benieuwd hoe je 'm gebruikt! Ooh a nice aubergine shade would be nice indeed :). OPI Vampsterdam perhaps, to eliminate the brushstrokes? Aww thank you KayJay ♥.